This commercial-sized filter is second in size only to Madesco's "Big Daddy" filter, also sold on Amazon. The "5-gallon" in the description refers to the amount of cold brew coffee the Madesco filter bag produces, not the amount of coffee the filter holds (five gallons of coffee grounds would make 25 gallons of coffee!). 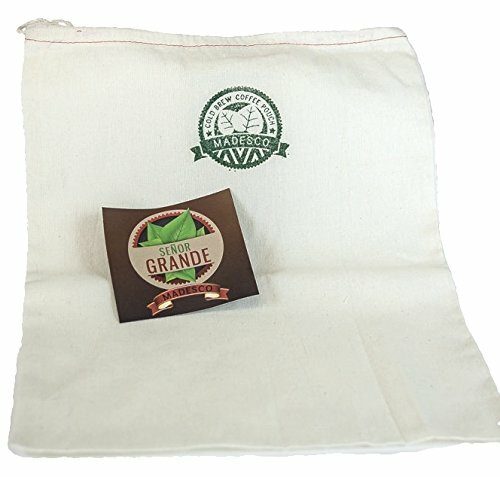 Restaurants generally brew with 5-gallon brewer buckets - and Madesco's "Senior Grande" filter holds much more than the 2 lbs. of coffee grounds required to produce cold brew coffee for these brewers. In fact, most 5-gallon brewers actually brew 4 gallons of coffee since room within the brewer is taken up by a full coffee filter. Again, Madesco sells a larger cold-brew coffee filter - "The Big Daddy" - that can accommodate a 7-gallon brewer. By all means, avoid "pillowcase filters" that fit over the top of a bucket - as they're simply too wide. While some competitors make "pillowcase filters," Madesco knows that coffee grounds deep in the center of such a filter never get to contribute their flavor to the brew for lack of water-flow and water exposure. Width is the key! Madesco's durable 2-ply filter width at 12 inches ensures most all the coffee grounds are less than 3 inches from brewing water. When Madesco devised its larger "Big Daddy" filter it didn't widen it, it lengthened the filter by 25 percent to ensure the coffee grounds remained no more than 3 inches from the brewing water. NO GROUND LEFT BEHIND !!! This is a big deal - in that it saves café owners money by efficiently brewing more cold-brewed coffee using less ground coffee. What's more, since there's no need for pricey paper inserts (as required by competitors' systems) cost savings are significant over the course of a year! Madesco has many many many commercial customers that appreciate that fact. STOP PAYING $300/YEAR ON DISPOSABLE PAPER FILTERS! Repeat-purchases of expensive paper filters are a thing of the past! Unlike others', our highly regarded reusable filters are lined to provide a 2-ply "second line of defense" against fine grounds making their way into the brew. Sturdy construction easily withstands the rigors of repeated use.Natural cotton blend, no bleaching, no harmful chemicals. 3 FREE BONUS BOOKS AND INSTRICTIONAL VIDEO! - A link on our Madescolabs homepage directs Amazon customers to all three downloadable recipe books. Product packaging includes easy instructions, and the Madescolabs homepage provides a video with a step-by-step cold-brew coffee brewer's demonstration..
LIMITED WIDTH IS KEY! Our filters' width at 12 inches ensures most all the coffee is less than 3 inches from surrounding water. Our liner offers a "second line of defense" against penetration of even the finest ground coffee. Our double-ply construct better withstands rigors of repeated uses than a single ply filter. Easily make up to 5-gallon batches of delicious cold brew coffee, different coffees, and extended life. SAVE HUNDREDS $$$ YEARLY - NO EXPENSIVE PAPER FILTERS - our reusable filter is much more affordable than competing restaurant/industrial cold brew coffee systems. Madesco - a name synonymous with cold-brew coffee among the pros. Reusable - no subsequent ongoing filter purchases required. See Madesco's other listing for bundled dispenser/brewer and commercial filter 2-pack. If you have any questions about this product by Madesco, contact us by completing and submitting the form below. If you are looking for a specif part number, please include it with your message.